Wie Geht’s? Hier ist mein German page! I have to say this page is directed mainly to Americans, and that is because there are some stereotypes that have to be overcome with regards to this Central European country. Let’s take it from zee top, shall vee? German myth #1: German’s are mean, uptight, and all together unpleasant to be around. Usually this statement is followed by, let’s go to France instead. If you want to see mean, then by all means, go to Paris. (See my France page for survival tips) The reason many (Americans) feel this way is because of the difference in communication style. As you travel to different countries in Europe (and in the rest of the world, for that matter) you’ll find greatly different rules of etiquette. For example, in China it would not even be the slightest bit rude to slurp, burp, and pass gas at the dinner table. Not that there’s anything wrong with this form of manners, assuredly Americans do things that offend other world cultures (like being obnoxious, uneducated, and all together distasteful as soon as they leave their home soil). High speed trains are great and all, but a good old-fashioned regional train has a certain ambience. One of adventure and chewed gum under your seat. I remember once visiting Scotland. I was leisurely nosing around a gift shop (not a usual place I like to be) having a grand old time actually. I was trying on a Sherlock Holmes’ style hat, when in blasts through the front door, no no, please no, it couldn’t be…an American. Already anticipating the onslaught of embarrassment to follow, I promptly hid behind the collector spoons (don’t even get me started on those) quivering and clenching at every word he uttered. “DO YOU SPEAK ENGLISH? !” he begins his conversation with. Not a “Hi, how are you?,” no this tourist needs to ask a clerk that’s from a country that has spoken english, centuries before George Washington was in a diaper, if he knows how to speak his own language. Wouldn’t you know it, all he needed was a travel adaptor. I was just about to give him mine and swiftly cover his mouth with duct tape (never leave home without it) when he blew through the exit in the same manner he entered. He couldn’t understand the beautiful Scottish brogue that the clerk had answered in. “Can’t find a soul that can speak ‘American’ around here” he muttered to himself under his breath as he stormed out. Checking to see if the coast was clear, I slowly rose from the rack of silly tourist spoons and pretended to be Canadian for the rest of the day. Cool little cabins on the water you can rent for the weekend. Germans may have many negative stereotypes that we have given them, but remember Americans have ten times as many stereotypes from practically every European country…well maybe except Belgium. (Belgians are, quite possibly, the most welcoming and accepting Europeans you’ll find. More on that later.) So let’s break it down. “Germans are mean” is the thrust of German Myth #1. So, are they? Nope (or, should I say, Nein!). But they do have a different style of communication, if that’s what you’re referring to. A German might say: “Give me that piece of cheese, please”, where an American would conjure up a sentence like: “Would you by chance happen to have a piece of cheese that I might be able to try, if it’s not too much to ask?” We’d personally consider the latter to be more polite, whereas the Germans would simply consider it inefficient. If you want cheese, just ask for it! That goes for all aspects of conversation in Germany. Don’t bother beating around the bush, it just wastes time. How can the German language be that bad if you can use ‘fahrt’ in everyday conversation and people still respect you! If you want to hear phlegm in a language visit The Netherlands, or Germany’s southern neighbor, Switzerland. In some of those regions, I swear they must have to drink a gallon of milk just to be able to speak a full sentence. Germans, especially from the north, have a very crisp, clear, and concise manner of speaking. In my opinion, it’s quite pleasant to listen to. Who doesn’t like a good German accent? German Myth #3: German’s don’t know how to have a good time. Hello! Have you never heard of lederhosen? How can you not have a good time wearing suspender shorts and feathered hats? I rest my case. Then, if those three myths don’t work, someone has to mention Germany’s wartime past in an attempt to ‘save’ you from visiting such a terrible place. Really? Can we just let it go already? Yes, we all know it was terrible, but the generation that was involved in that whole debacle has all but disappeared. They’ve paid for their mistakes, they are still apologizing to this day, and they’ve made it illegal to even entertain those disgusting notions of the past. So please, don’t let what happened 70+ years ago decide whether or not you visit this underrated tourist destination. Phew! Now that we’ve got that out of the way, let’s get to the fun stuff. Just like other countries that I’ve posted about (i.e. France), there is a definite North-South divide. In the North you’ll find a more clean, pristine, and precise culture. One that we (again, I’m talking about Americans) may consider to be more ‘uptight.’ You’ll soon find that Northern Germans are just as fun to be around. In fact, my closest friends in Germany are from the North. As with France, the North has more cities to explore such as Cologne, Berlin, Hamburg, etc; however, if rustic beauty is your aim, then the South is where it’s at. Mountains: check, rivers: check, castles: double check! The Cologne Cathedral is the most visited landmark in Germany. Attracting 20,000+ a day. This church has the largest façade of any cathedral in the world. Here’s what inside one of the spires looks like after climbing 500 steps. In my opinion the best way to travel in Europe is to pick a (cool) hub city to stay in, and explore the surrounding areas to your heart’s content that is accessible by no more than a 3-hour train ride away. Any longer and most of your day will be consumed with travel. When visiting Southern Germany, the most logical choice of a good hub city would have to be Munich (München). While the city in itself is astounding to galavant about in, the surrounding areas are just as diverse and spectacular. While in Munich last time, I decided I wanted to visit a concentration camp. Not exactly a party starter, but if you do have an interest in world history then I’d definitely recommend Dachau (Wow, I never thought I’d ‘recommend’ a concentration camp). If you have a soft heart and a weak stomach, visiting death camps such as Auschwitz (which is actually in Poland) or Sachsenhausen would completely throw you into a depression for the rest of your life, whereas Dachau was a labor camp with fewer atrocities. 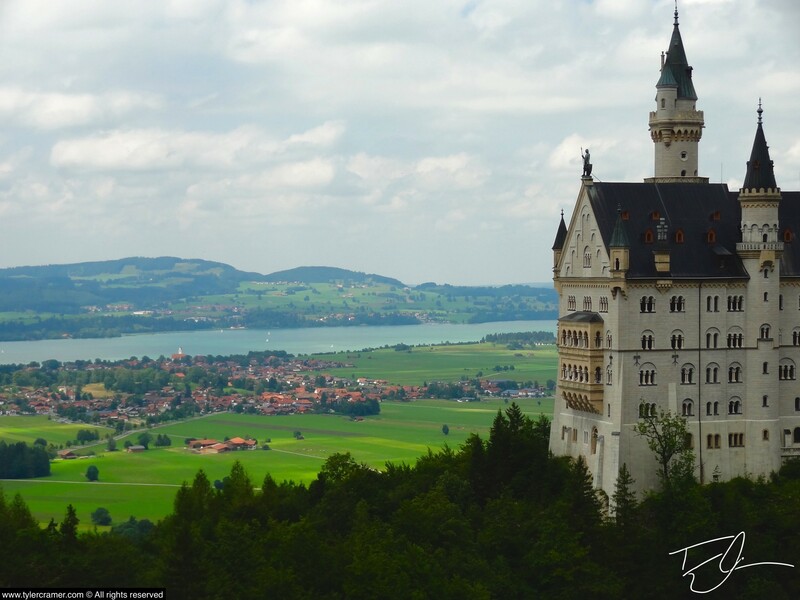 If you would prefer to visit something more ‘uplifting’, then certainly check out Neuschwanstein Castle (Fun Fact: that’s German for ‘New Swan Stone’ Castle. It makes the name sound less intimidating, doesn’t it?). Hop on a train to Füssen and in a couple of hours you’ll be seeing the castle that Disney based their famous Cinderella Castle after (This one’s much more convincing). The best part about visiting Neuschwanstein is that there are no inebriated hobos dressed up as oversized stuffed animals trying to hug you and shake your hand the whole time. It makes me shiver just thinking about that. Once upon a time, King Ludwig II of Bavaria (the guy who commissioned this monstrosity) was greedily using up all the taxpayers hard-earned cash to build this luxury estate. However, it was not completed during his lifetime. That’s probably because he was found dead in a river. Coincidence? I think not. So much for a fairy tale ending! As in most European countries, don’t be afraid to wander. Who knows what you will stumble upon! If you’re there around Oktoberfest (in Bavaria it seems like every month is Oktoberfest, they just put the month in the name to sound like they have self-control) you can expect to see lederhosen, taste great beer and ‘apfel strudel’, and hear Schlager music. What is Schlager you say? Imagine music that resembles rabid squirrels chewing on bubble wrap through a megaphone. Needless to say, it’s the worst thing I have ever heard. Sorry, Germany. You’ve got great things going for you. Just work on your music…PLEASE, because my ears are bleeding and just the thought of being horrified again by that reprehensible swine fodder makes me want to crawl into a padded cell, don a straight jacket, and rock back and forth violently, humming “You Are My Sunshine”. These Oktoberfest tents abed the dreaded Schlager instead of killing it before it multiplies. The only selfie I can approve of is at a great distance inside of a covered bridge in a foreign country. Besides castles and concentration camps, there is plenty to see in the areas surrounding Munich. The first thing I do when I visit a country is to haul out the map (ok ok, I haul out my smart phone) and see where the closest country border is so that I can check off another country from my list (for the official rules on crossing a country off of one’s list see my “Fiji” post)! The closest foreign country to Munich was (and still is) Austria. The moment I found out that I could be in Salzburg in less than 2 hours by train, I screamed like a girl (involuntarily, of course *clears throat to make voice sound deeper) and tore off down the road to the nearest train station. There, in Salzburg, I made the biggest mistake of my entire trip. I purchased a genuine Tyrolean Hat (you know, one of those cool little green Bavarian-style hats with the feather in it). Why was that a mistake? Well, it started raining. I decided that since the inside of my hat said “wasserbeständig” (water-resistant) in big letters, now was a good time to try it out. The moment I ornamented my head with this fine piece of felt, hordes of tourists came barreling down the boulevard with pitch forks and torches and picket signs that read “Where is Mozart’s house?” and “Where is the nearest bathroom?”. Clutching my hat for dear life, I sped down to the train station, narrowly escaping onto the next train back to Germany. I sighed with relief. Slouching in my seat, I watched the angry mobs grow smaller and smaller in the distance. A nice older German lady was sitting next to me. She looked at me very intently for a moment and then asked: “Any idea how I get to Hohe Straße from here?” Without a second thought I thrust my newly acquired headpiece into the trash. Walking up to the Hofbräuhaus in Munich. Editor’s Note: If you find a green felt hat with a feather in a waste receptacle on the Salzburg-München Train kindly return it to the address provided. Oh, and if you see an older German lady that looks lost, tell her to head North on Kartäusergasse for two blocks and Hohe Straße will be on her right. When I read your stories it feels like you’re here with us sitting in the livingroom having coffee talk and you’re making us all bust a gut laughing! Good job!! Mission accomplished! I wish I was having coffee talk with you guys. Can you believe next time I see you guys we’ll all be in Belgium?! Can’t wait!! Hello! I understand this is kind of off-topic but I had to ask. Does managing a well-established blog such as yours require a lot of work? I am brand new to writing a blog however I do write in my journal everyday. I’d like to start a blog so I will be able to share my own experience and views online. Please let me know if you have any kind of recommendations or tips for new aspiring bloggers. Thankyou! Not a problem Buddy. Thanks for calling it ‘well-established’! I’m actually fairly new to blogging as well! I’d recommend getting your domain from iPage and using WordPress to build your site. When you’re just getting going, it can seem overwhelming. Do a lot of research on what plugins you need or want for your site and most importantly keep your posts regular and unique. If you have any more questions, let me know.